What are ledger angles for? Ledger angles serve two purposes one to support vertical load. as shown on detail 29 below, ledger angles are attached to the side of the foundation wall whether it be concrete, cmu block, tiltup, or precast walls. Ledgers usually align with the metal decking at roof level or floor level for the deck to be welded to. This connection will transfer the dead load and live load from the floor or roof to the foundation walls. There are several different ways that steel angle ledger can be attached to the foundation. 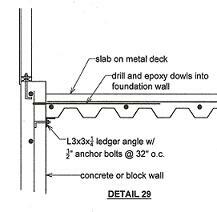 One way is to install anchor bolts at the side of the wall as shown on detail 29. Other times instead of installing the anchor bolts with concrete or cmu block walls, the bolts are drilled and epoxy or use expansion bolts. Another method of installing ledger angles is install embed plates 3/8 inch thick by 4 inches wide 4 inches long (PL3/8x4x0'-4"). These plates will have two half inch diameter Nelson Studs attached to them. These embed plates will be nailed to the concrete forms with the Nelson Studs side into the concrete. For cmu block construction the embeds are placed at the side of cmu block walls before grouting. The ledgers will later be welded to these embeds. The second function of these ledgers, they transfer lateral load caused by wind or earthquake load. Concrete walls and cmu block walls are also shear walls. Similar to the function of braced frames in steel structures, concrete or cmu block shear walls provide the lateral stability to building the same way braced frames do. Steel ledgers are also known as drag where they transfer or drag the load from floor or roof to the shear walls.